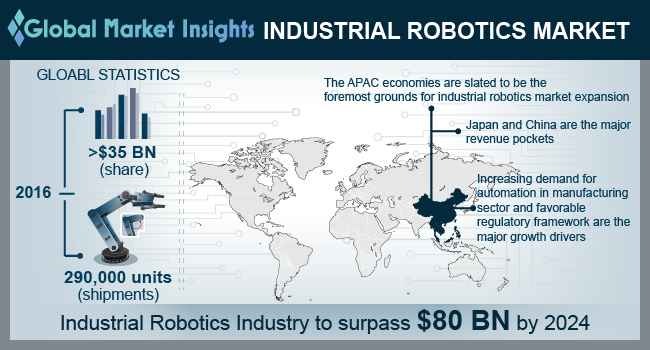 Industrial Robotics Market size is set to exceed USD 80 billion by 2024; according to a new research report by Global Market Insights, Inc.
Industrial robotics market is expected to grow at a significant pace, owing to the continuing trend of automation across several end-use industries. Robots are being increasingly adopted by the companies to perform repetitive or risky tasks such as deburring, grinding, part inspections, and bin-picking. Automation through this equipment enhance efficiency of several processes ranging from raw material handling to the packaging of the finished product. The adoption of this technology across industries has enabled the companies to increase competitiveness based on price, offerings, and business reach, thus propelling the industrial robotics market growth. Growing trend of adoption of ‘lights out’ production concept in modern manufacturing is expected to drive the industrial robotics market growth. In ‘lights out’ production, the manufacturing activities are handled using automation. The companies are adopting the technology to reduce human involvement in the repetitive, uncreative & dangerous tasks, eliminate errors, and cut manufacturing costs. For instance, at Fanuc plant in Japan, only four workers supervise the production of industrial robots by industrial robots. Furthermore, since 2013, Canon began phasing out the human labor. Increasing advancements in technologies such as software development, computing power, and networking have reduced the cost of installing, assembling, and maintaining robots, thus providing growth opportunities to the industrial robotics market. For instance, traditionally, components such as sensors and actuators had to be connected individually to the controllers using terminal racks, junction boxes, and connectors. However, with advancements in plug-and-play technologies, the components can be connected to the controller by simple network wiring. Although, the technology performs tasks accurately, requires high degree of expertise and technical training for initial setup. The end-users require expertise and service package from the system manufacturers to ensure error-free setup. Furthermore, the performance of these systems highly depends on the performance of the surrounding systems such as conveyor systems, grippers, and vision systems. This is expected to hamper the industrial robotics market growth over the forecast timespan. The articulated segment of the industrial robotics market has significant penetration, owing to the high degree of versatility offered by these systems. These robots have higher degree of freedom than other systems, that makes these systems usable in several tasks including welding, dispensing, material handling, and material removal. The prices of these systems are expected to witness fall over the next seven years, owing to the longevity and popularity. Industrial robotics market is projected to witness surge in demand from the automotive industry, owing to the increasing adoption by the car manufacturers to improve precision and efficiency of the production lines. According to the Robotics Industry Association, more than 50% purchases of robots in North America in recent years are made by the automotive industries. Technological advancements such as robotic vision, collaborative robots, and robotic hand are encouraging more automakers to implement the technology in their production plants, thus positively impacting the industrial robotics market growth. The German industrial robotics market strength is driven by a combination of the region’s proven engineering tradition, position as a leader in technological development, and its highly diversified industrial base. Germany is witnessing immense innovations which are helping bridge the gap between robotics and several industrial sectors. Stakeholders are organized in multiple regional organizations such as the Automation Valley Northern Bavaria. The country’s specific strength in the development and manufacturing of industrial robots is further strengthened by the existence of specialized organizations such as the Robotics and Mechatronics Center at the German Aerospace Center (DLR). Growing need for automation in manufacturing pharmaceutical units has led to the growth of the Japan industrial robotics market. The units are used for easy and quick accomplishment of medical tasks. Companies in Japan are increasingly using collaborative robots such as UR3 ROBOT by Universal Robots A/S, which are assisting the workers in injection molding, conducting lab analysis, and picking & placing drugs. Industry vendors in the industrial robotics market include Fanuc Corporation, Denso Corporation, Kawasaki Heavy Industries Ltd., Yamaha Motor Co., Ltd., KUKA AG, Mitsubishi Electric Corporation, ABB Group, Epson America, Inc., Panasonic Welding Systems Co. Ltd., Rethink Robotics Inc., Staubli Group, Universal Robots A/S, Yaskawa Electric Corporation, etc. Outsourcing or subcontracting of the manufacturing process to third-party entities is a common trend among technology manufacturers. This trend is highly magnified in countries such as the U.S. and Western Europe where these resources are available at very high costs.